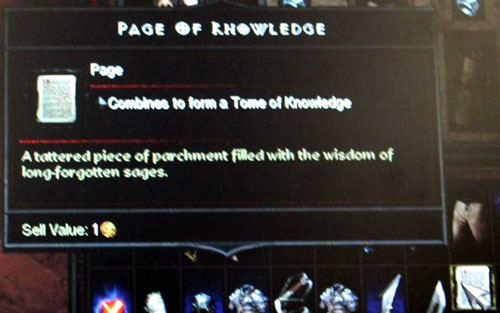 A [wiki]Page of Knowledge[/wiki], as seen in the Blizzcon 2010 demo. Several of these must be found to create a [wiki]Lore Book[/wiki] which will then give more details about the game world, plot, or story. I don't think Lore Books and Tomes of Knowledge are the same items. 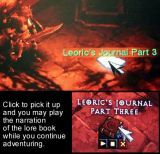 "Lore" item types are said to be displayed in green color (Pages of Knowledge are white - common items). Could be, or maybe this is white since it's not combined into a tome of anything readable yet. Perhaps the Tome of Knowledge turns green when it's finished? Or perhaps this is just part of a recipe, and if you find multiple pieces then it's a recipe you can give to an artisan so they learn a new crafting option. The Diablo 1, 2, & 3 Wiki! Recipe? Not likely, they will probably drop like a common scrolls. I lean towards a new respec system (speculation of course).